Street safety professionals, elected officials, and advocates from cities around the world gathered in New York today for the Vision Zero for Cities Symposium, a conference organized by Transportation Alternatives to examine New York’s street safety approach and share best practices for eliminating traffic fatalities. Big changes for Queens Boulevard: Queens Boulevard will have its speed limit lowered to 25 mph by the end of the year, Trottenberg announced. (Although DOT said in May that the “Boulevard of Death” would become an arterial Slow Zone, the agency previously said it would maintain the street’s existing 30 mph limit.) 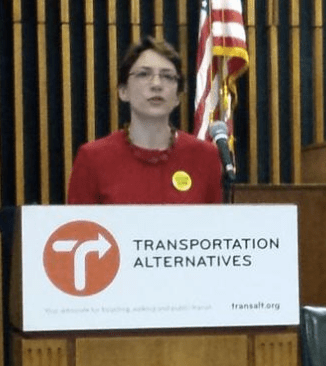 Trottenberg also confirmed that DOT will soon host meetings to kick off a comprehensive redesign of Queens Boulevard. Fewer bad drivers are slipping through the cracks at TLC: For three years, TLC let 4,500 dangerous drivers stay on the road because it incorrectly tabulated data from the Department of Motor Vehicles as part of its “Critical Driver Program.” The program revokes or suspends hack licenses of cabbies who have accumulated points on their drivers licenses. Since fixing the error in September 2013, Joshi said TLC has increased the number of suspensions or revocations four-fold, to 3,000 so far this year. Keeping tabs on dangerous driving: The city is already expanding the use of CANceivers, which can record months of driving data, to its entire fleet. The aim is to improve the safety of city drivers. “If that person is speeding, their boss is gonna know,” Trottenberg said. Joshi said today that TLC’s fleet, such as its enforcement vehicles, has had the new tech for the past few months. TLC hopes to approve pilots for black box technology in some taxis soon [PDF], which would collect less information than CANceivers but more than the limited black boxes found in virtually all new cars. More traffic injury data now public: NYPD and DOT weren’t the only agencies with news about traffic safety data this morning. Department of Health Assistant Commissioner Nancy Clark announced that her agency now posts data on emergency room visits and hospitalizations for bicyclists and pedestrians to its website. If the choice is between engineers with an autocentric mindset who ignore pedestrians and legislators starting to respond to constituent complaints about dangerous roads I’ll let the latter set speed limits. NYC has enough people who don’t drive to get away with speed cameras. They’ve done great work in DC, they can do the same here. You think the entire arterial network could be rebuilt in 5 years? Keep dreaming. 20-40 years. The city is small. People will leave to buy gas if you charge $5 a gallon. Choice 3-choose traffic engineers with non-autocentric mindset. They obviously exist as we saw with JSK. If you think legislators should interfere with speed limits then why not with bridge designs, or building designs, or railways, and anything other subject on which they feel they might know more than people who have been studying that subject for decades? Do you see what I’m getting at? These people are arrogant beyond belief thinking they know more than experts. In fact, that’s an ongoing societal problem. All the Monday morning quarterbacks think they can do things so much better than people who have been doing these things their entire life. As a result, they meddle. When the end results predictably don’t go as expected, we blame the experts for it when the real reason was we didn’t sit back and let these experts do their job. Ever consider that maybe if community boards didn’t stop traffic calming measures, or insist on traffic signals only instead of other solutions every time there’s a safety issue, that we might actually already be well on our way towards getting traffic violence under control? And then there’s the fact these are public thoroughfares which people use to get from point A to point B. The needs of the entire city for these thoroughfares to function efficiently (that includes for buses, bikes, and delivery trucks, not just for private autos) trumps local concerns of community boards. True story-one of my customers insisted that I design in a particular part in a product because they saw some slick ad or something. It wasn’t the appropriate part for this particular design by a mile. After futilely attempting to explain why, I said screw it and did what they asked. The end product had 3 times as many parts (needed in order to get their chosen part to work even marginally) as what I could have designed. It cost too much, took too long to make, and was a commercial failure because competitors made designs closer to what I might have made. I think they lost upwards of $100,000 on that venture. That was the last time this particular customer ever interfered with the electronic aspects of the design. They just stuck to doing what customers should do-tell me what it’s supposed to do, what they want it to look like, and an estimate of what it might need to cost for them to make money on it. Armed with just those things, I usually can come up with a decent design, although sometimes customers give me unrealistic cost estimates and I have to tell them it just can’t be done for that price. Moral of the story-keep your two cents out when you’re not trained in a subject. That especially goes for patients who ask their doctors for some pill because they saw a TV ad which made it look like the greatest thing since sliced bread. In this case, it’s perfectly fine for legislators to give a general mandate, like Vision Zero. That’s what they’re supposed to do-set a general direction. Let traffic engineers handle all the particulars to reach that mandate. Thank you Trottenberg. It’s become woefully obvious that several DAs and a lot of police are just routinely letting reckless drivers get away with killing people. It’s not just shameful, it’s actually dereliction of duty on the part of the police and assistant DAs, which makes them subject to removal from office for cause. The elected DAs, of course, should be removed by elections.